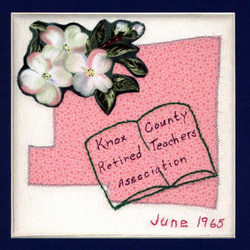 The Knox County Retired Teachers Association was established in 1965 in Mt. Vernon OH. Mt. Vernon is known as the Dogwood City. The chapter has given $100 worth of books annually to the Public Library since 1971 in memory of deceased members. Knox RTA donated a $500 scholarship to Ashland College in honor of Tyrone Nobel who served as our president for 14 years (1981-1996). Our chapter has 120 members and has had four presidents in 42 years. The anniversary quilt patches were made by member Virginia Mae Kline.